Directions: From Denver, take I-70 West to C-470 South. Follow C-470 South to the S. Wadsworth Exit. Make a right on S. Wadsworth and a quick right onto W. Deer Creek Canyon Road. The trailhead and parking area will be on the left (south). Hildebrand Ranch is one of the newest Jefferson County Open Space Parks and the Two Brands Trail is the only trail in the park. The trail is a loop that skirts the base of the Hogback over rolling hills and leads to Trailmark Park. The trail then winds through a residential area, and leads back to the parking area across open meadows. The trail is pleasant, quiet, and easy to follow. The only tricky situation is when you go through the residential area. Keep an eye out for trail signs and follow the paved trails east and you'll find your way. Directions: From Downtown Denver take Hwy 6 to Sheridan Blvd. Go north on Sheridan to Sloan's Lake. Sloan's Lake is a real gem in Denver's Parks system. Located on the edge of Denver and Lakewood in the Edgewater Neighborhood, the park provides all types of recreation. The paved trail around the lake is long, almost 3 miles. From the west shore you get a wonderful view of the Downtown skyline and from the east shore, you get a good view of the foothills in the distance. There are great restaurants and few good breweries nearby to add to your enjoyment. This is a terrific hike that visits every section of Matthews-Winters Park and crosses over into Red Rocks Park (Denver Mountain Parks). Start at the Dakota Ridge parking area and climb up the Dakota Ridge Trail. Hike the entirety of Dakota Ridge enjoying the panoramic views and the rocky terrain. The entire hike along the ridge is about 2.2 miles. 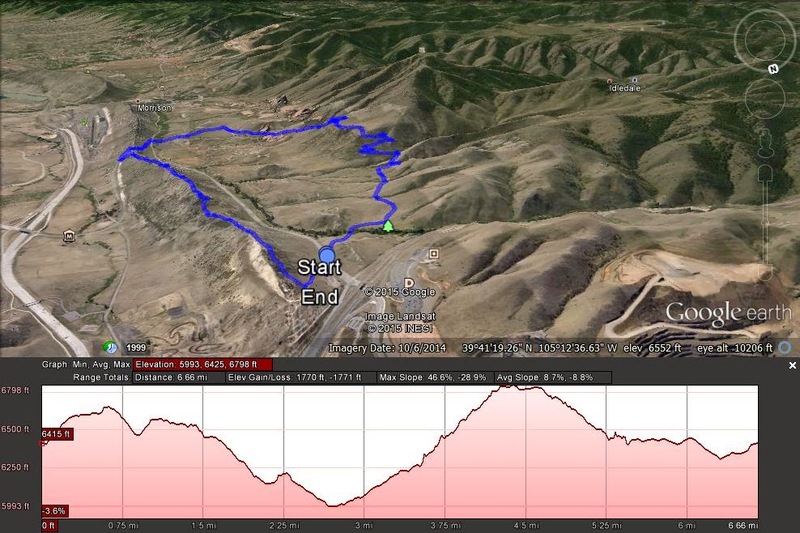 When you descend the ridge you’ll find yourself on the east side of the ridge at the paved Dinosaur Ridge road. Turn right here and look for the trail sign on the far side of the hairpin turn in the road. Pick up the trail and descend the west side of the Hogback for .5 miles to 93. Cross the road, carefully, and enter Red Rocks Park along the side of Red Rocks Park Road. Look to the right for the sign for the Red Rocks Trail. Follow this trail up and cross the gravel Red Rocks Trail Road. The trail picks up again on the other side of the road and parallels the road until it again crosses Red Rocks Park Road at a small parking area. Cross the road and pick up the Red Rocks Trail. After just a few minutes of hiking the trail re-enters Matthews-Winters Park and starts a steep ascent through a Red Rock wonderland. After 1.2 miles the trail meets up with the Morrison Slide Trail, turn left and continue climbing on the Morrison Slide Trail. When you finally reach the top of the shelf, take a few minutes to catch your breath at any of the many incredible viewpoints. When you can breath again, continue along the shelf hugging the cliff side until you reach the other end and start to descend. When you meet the Red Rocks Trail again turn left and follow the Red Rocks trail as it heads north. Descend the side of the Morrison Mountain and cross a small creek. From here the trail undulates with the hills until you reach the Matthews-Winters Parking area. Cross 93 again and return to the Dakota Ridge parking area. When all is said and done, you’ve travelled almost 7 miles and gained and lost about 1,300ft. Not bad for a hike 20 minutes from Downtown Denver!